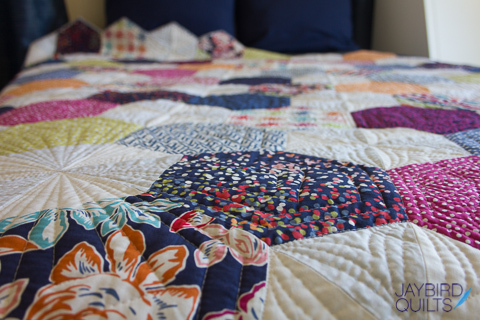 I'm so excited to introduce my latest full-sized quilt pattern, Delight! 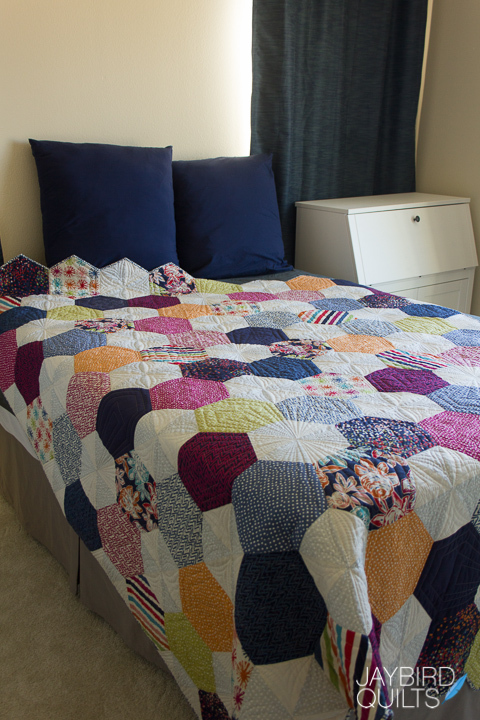 Quilt measures - 72" x 92"
If you have been saving or eyeing up some luscious large scale prints, you're going to love how those prints are featured on the large hexagons in this quilt! 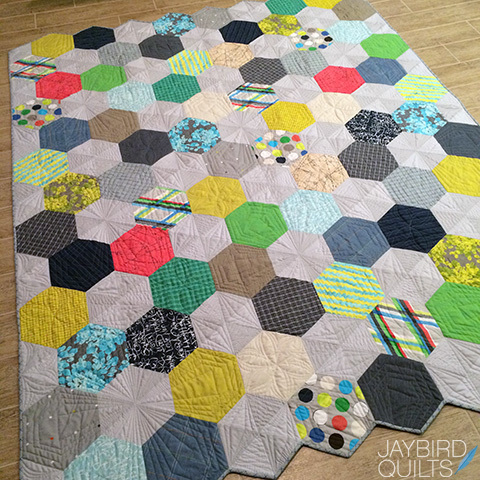 This is another fun quilt for all of my Hex N More ruler fans (click the link to the ruler to see the video tutorial on how to use it). 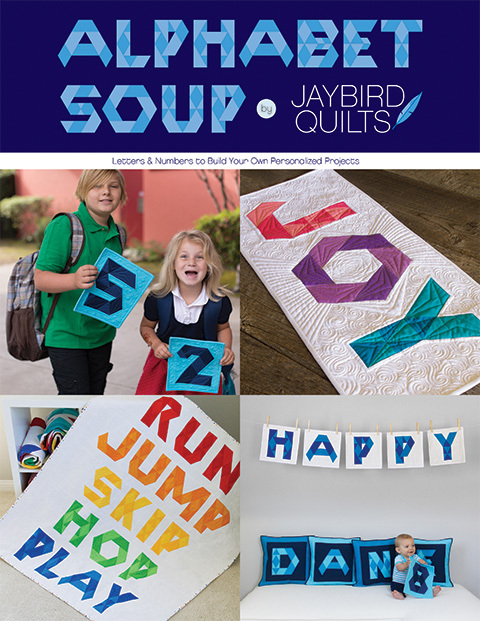 As usual, here are some of the outtakes from our pattern cover photo shoot. 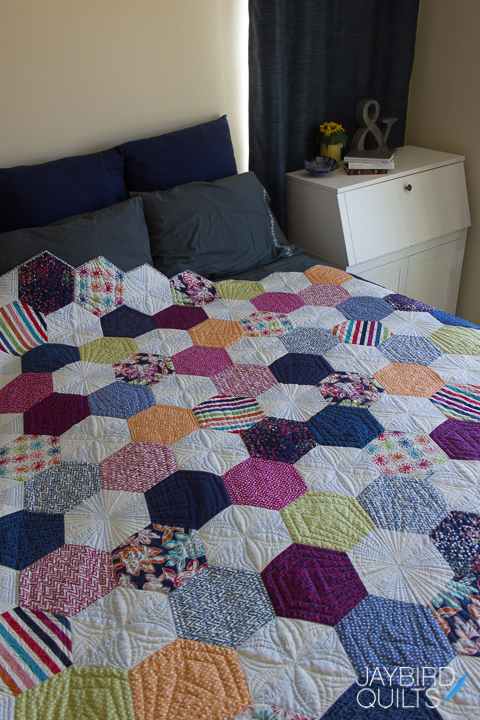 So, I made a twin sized quilt when I made the cover sample, which can be pretty tricky to photograph. And then I channeled my inner Vanessa Christenson to style the room a bit, but we had lost the sunlight we had earlier and it still wasn't quite right. And the lighting was great! 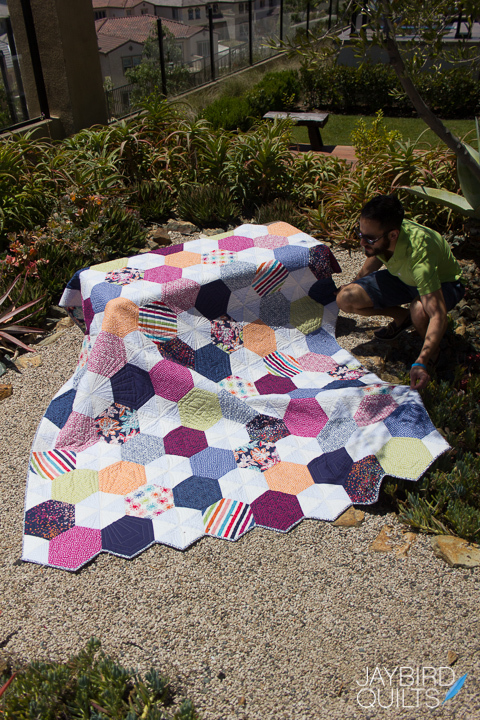 Gotta love a quilt in the garden! 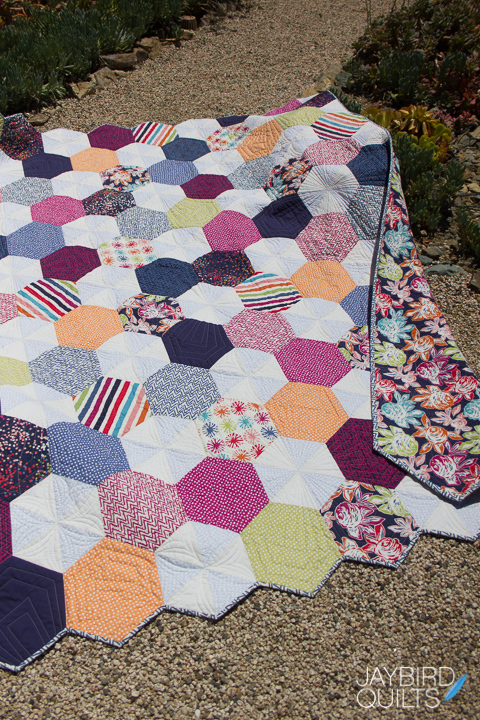 Here's a peek at the flannel Oh Happy Day backing on this (heavy) twin sized quilt. 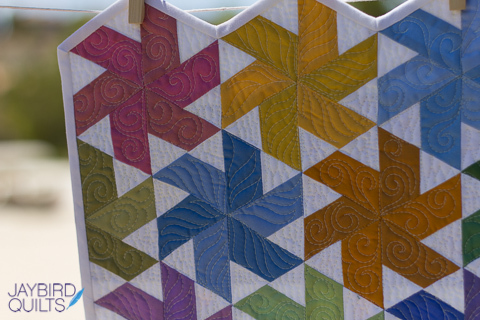 Angela's amazing quilting always adds these fabulous elements that give quilts a great shine! 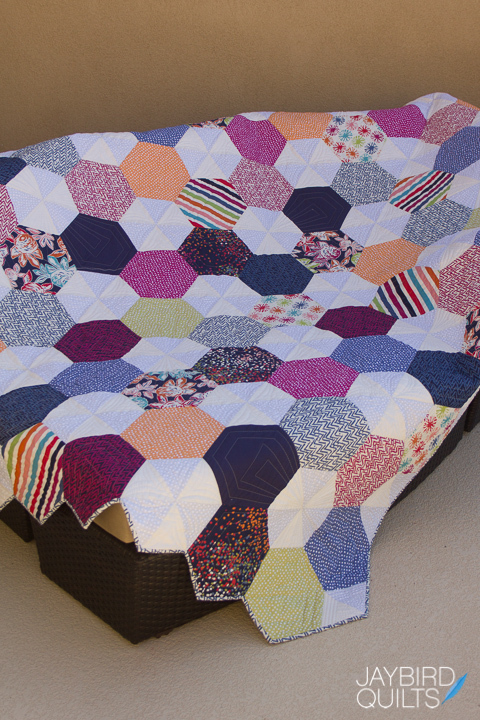 I love using a stripe or a check on the bias as binding! 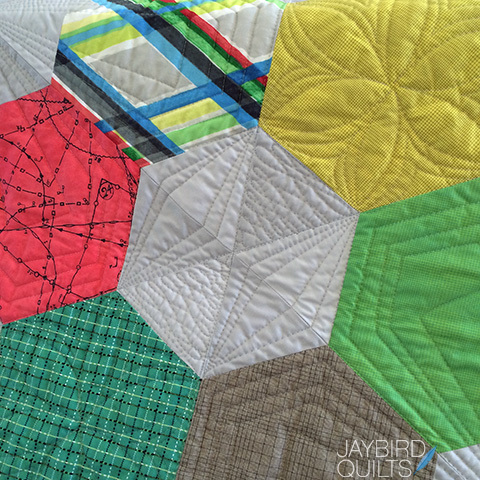 Check out my tutorial on how to bind quilts with 120-degree angles to finish this quilt. 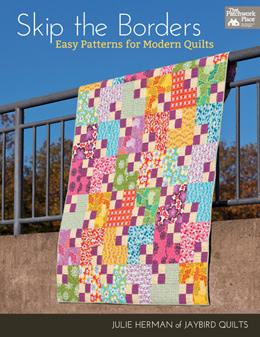 This pattern will be ready to ship to stores after June 1. 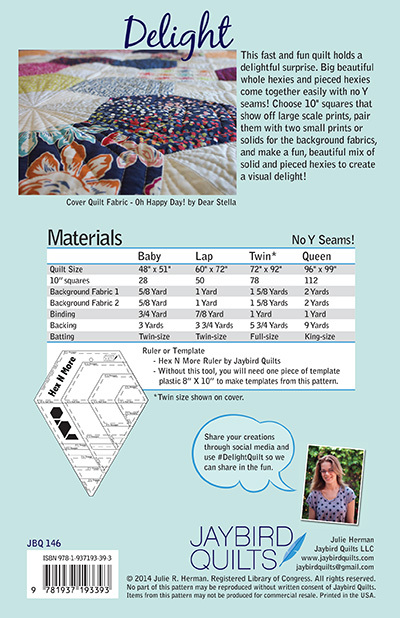 It is printed in full color, and it includes templates. 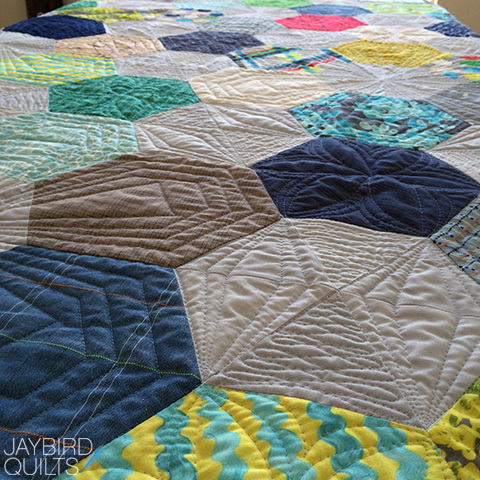 Plus there's no Y seams! 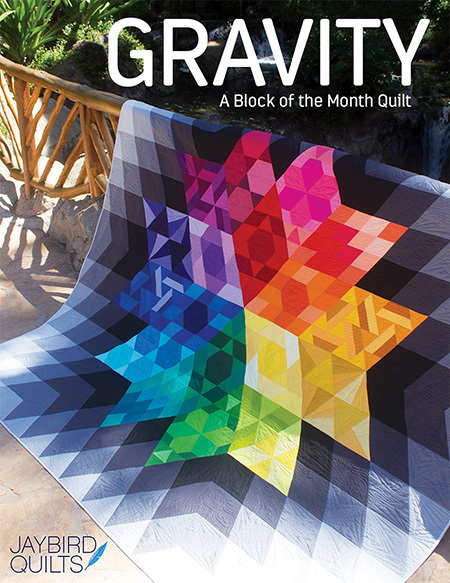 Ask around at your favorite local quilt shops to find out if they will be ordering it. 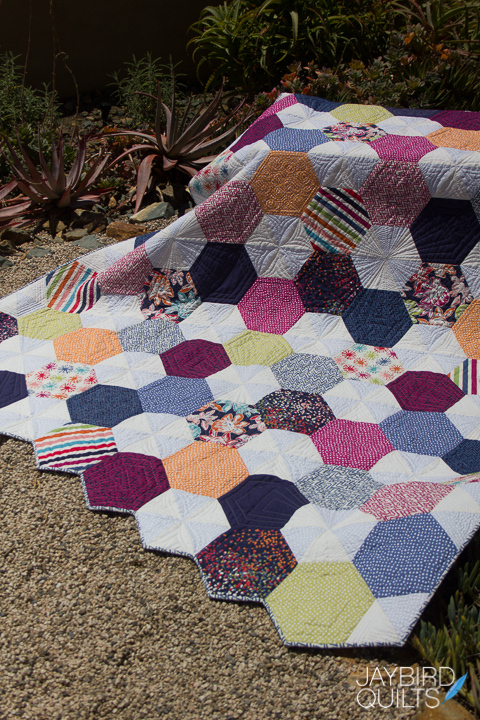 Delight quilt can be made in 4 sizes: baby, lap, twin and queen. 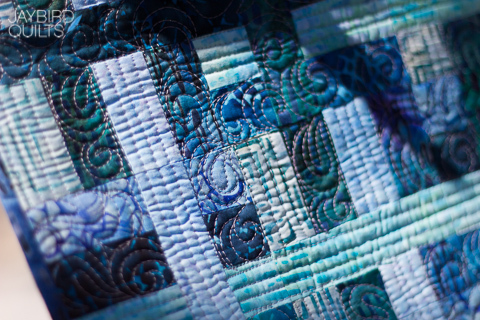 Be sure to share your photos on social media using #DelightQuilt so we can share in the fun too! 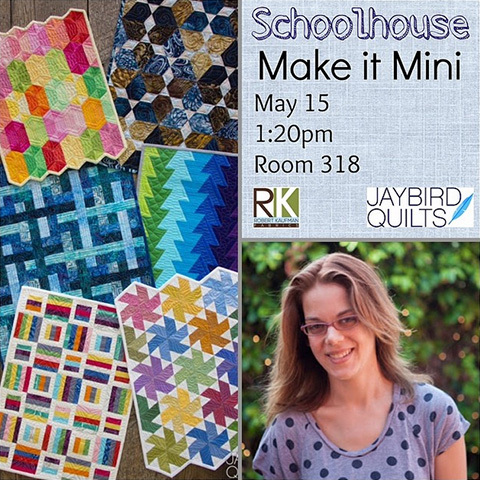 If you are heading to Quilt Market, I will be presenting a Schoolhouse featuring my new mini quilt patterns & Mini Hex N More. Please join us! 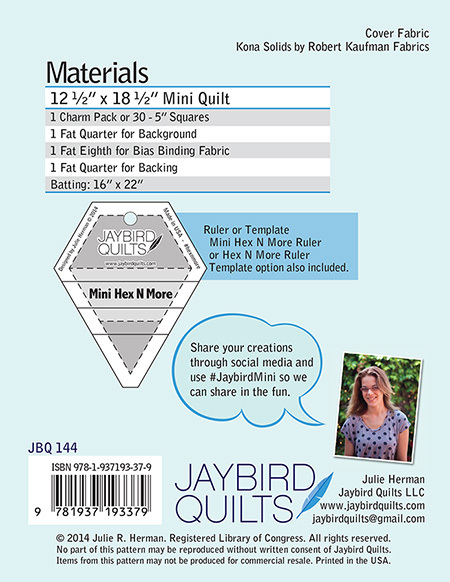 Julie Herman’s Hex N More ruler is now miniaturized with many popular patterns in quick finish sizes! 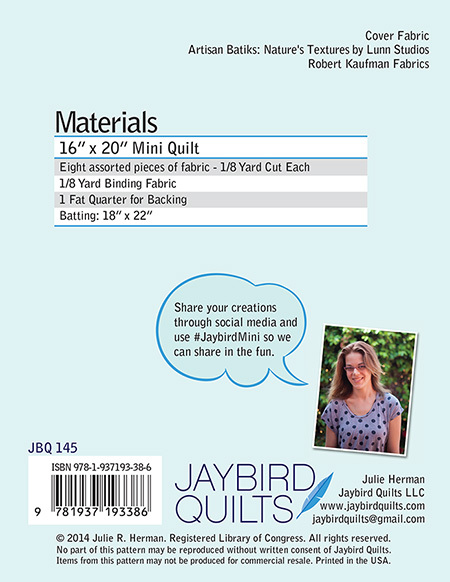 With an optional 'Project of the Month' format, these precut friendly minis will encourage your customers to keep quilting. I will also be doing demos at the Robert Kaufman booth, #1135, Friday & Saturday at 2pm, and the United Notions booth, #249, Saturday at 12:30pm. 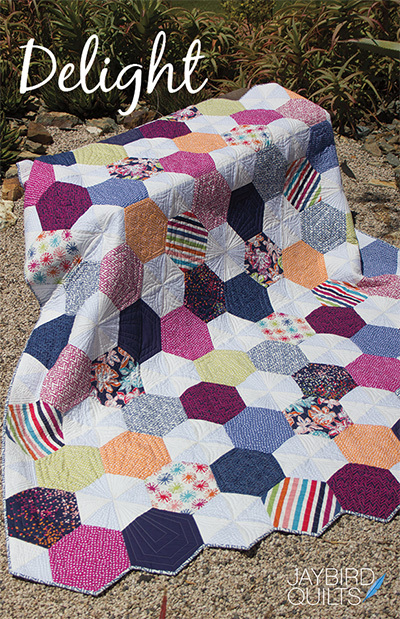 My quilts & samples will be in a few different booths around the convention center. 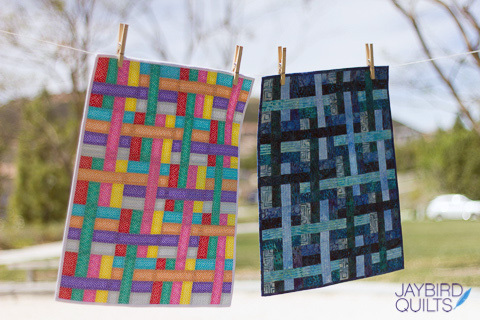 Andover Fabrics will have Rock Candy samples on hand. 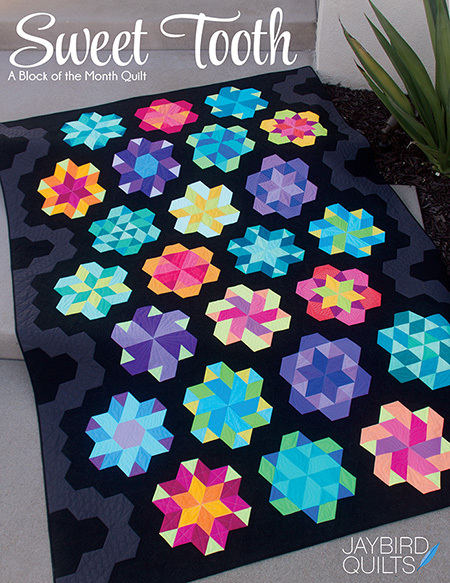 My newest quilt pattern, Delight, will be on display in the Robert Kaufman, along with all of my mini quilts. 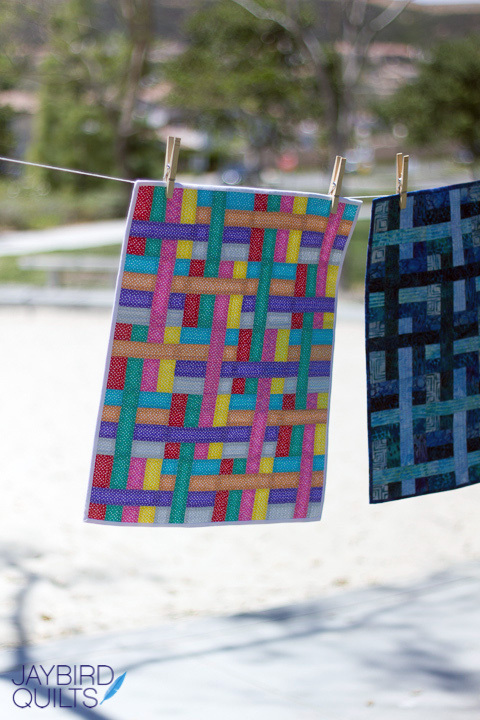 My mini quilts in Robert Kaufman batiks! 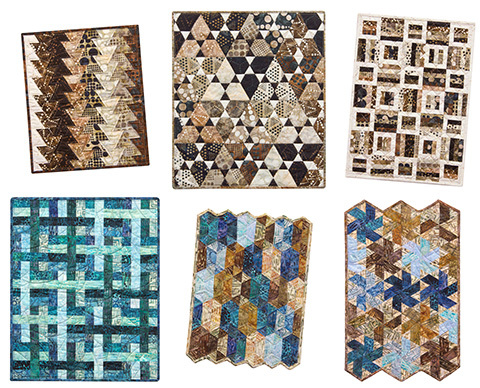 My mini quilts in Robert Kaufman precuts. 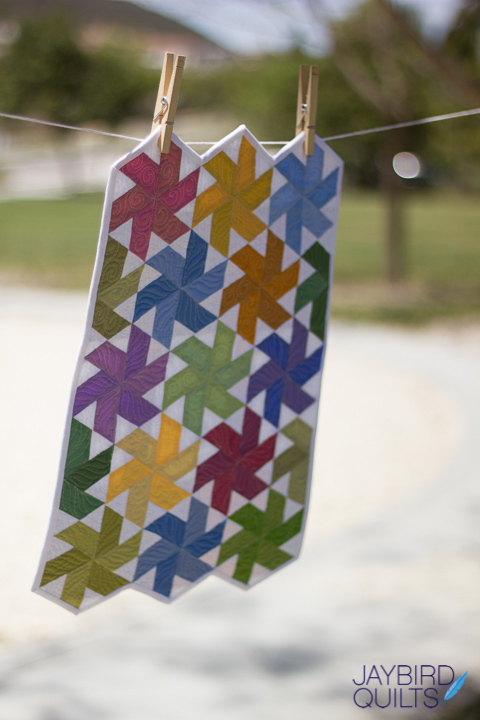 These will also be available as kits at sample spree. 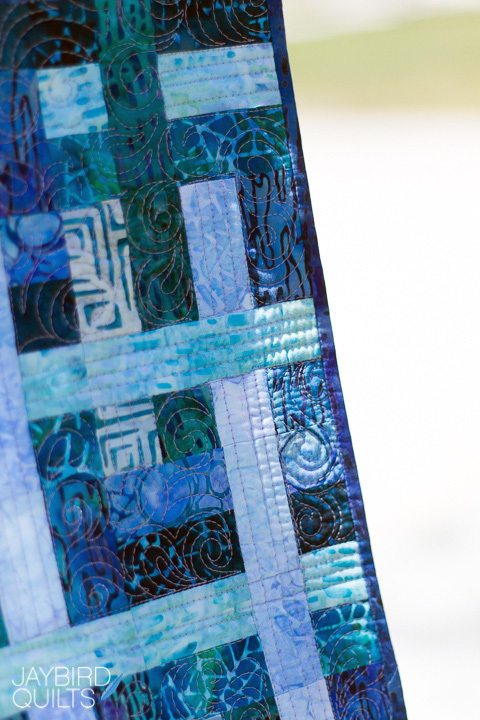 Quantities are limited so head over to the Robert Kaufman tables as soon as the doors open! 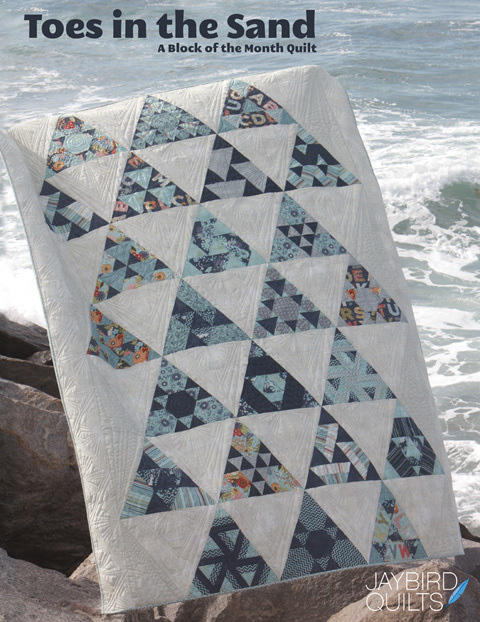 The Dear Stella booth will have my modern traditional mini quilt from the #DSTTchallenge, Mini Come What May and the twin sized cover sample of Delight. 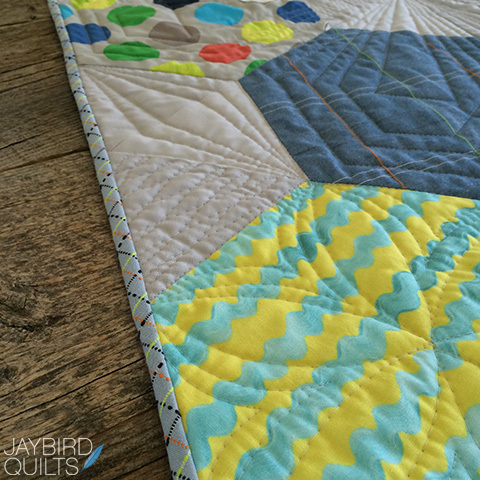 We also made a baby sized Delight quilt for Sara Lawson's booth in her new Jungle Ave fabric line. 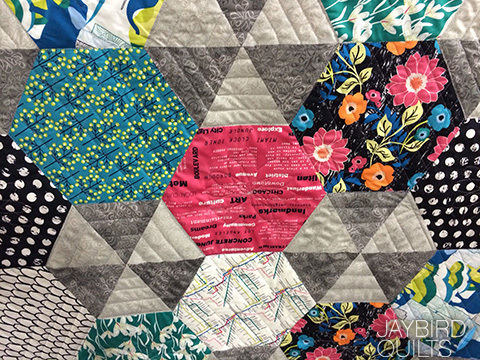 The Jaybird Quilts studio + offices will be closed while we're at Quilt Market, May 14 to May 20. 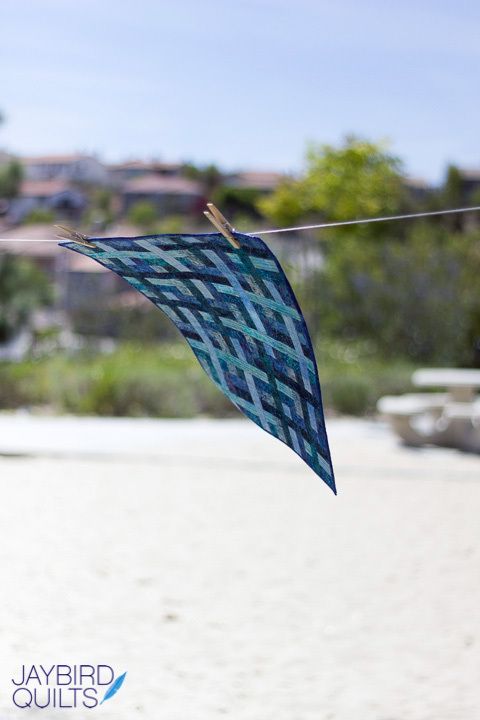 We'll reopen on Wednesday, May 21, and we'll follow up on your phone calls + emails when we return. 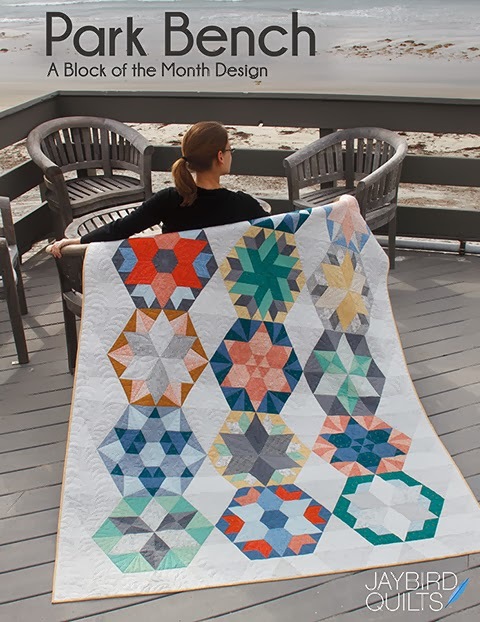 Today is Sew Mama Sew Giveaway Day! 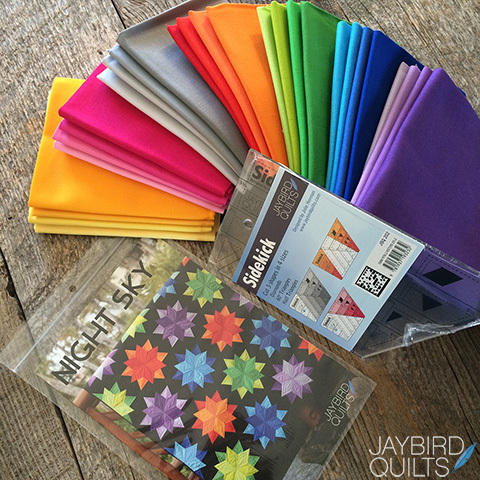 I'm giving away ONE sweet prize pack that includes 28 Kona Solid fat quarters, a Night Sky Pattern & a Sidekick ruler! 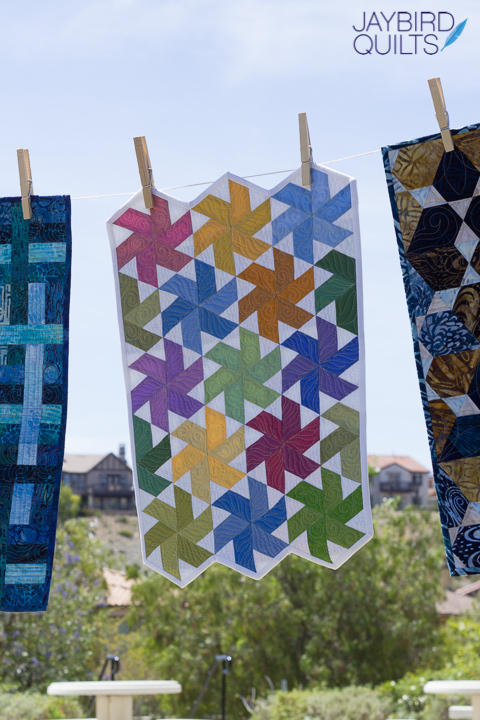 Sixteen of the 28 fat quarters make up the Jaybird Night Sky bundle from Robert Kaufman + the extra 12 FQ's are the color complements to make a large Night Sky quilt. That is over $80 of goodies!! 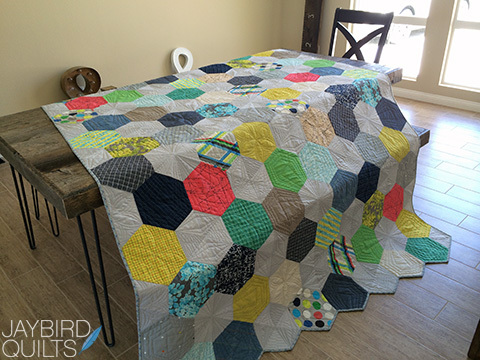 Pick out your favorite background fabric & you can make a queen or a king size quilt!! 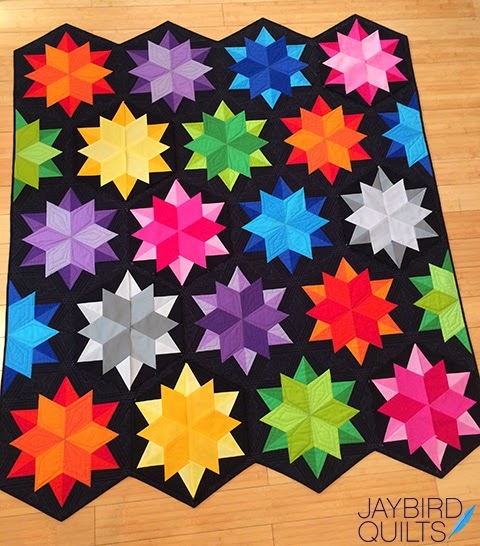 Here is what all the colors look like in a lap size version of Night Sky. 2. 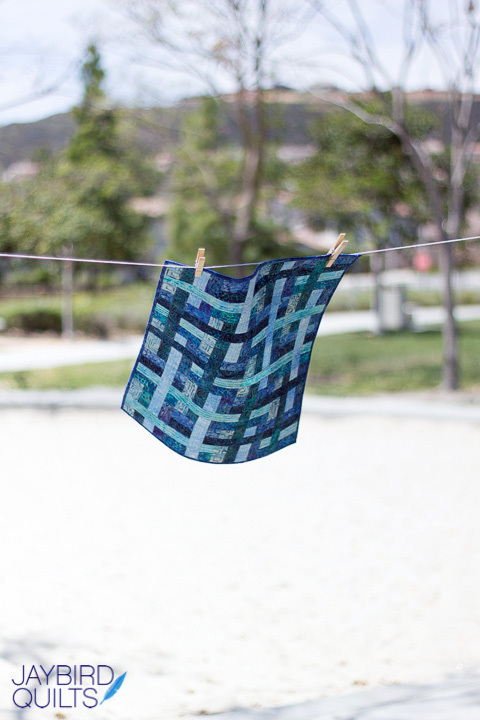 In your comment tell us about your all time favorite summertime sewing project OR a summer sewing project you can't wait to dig into. 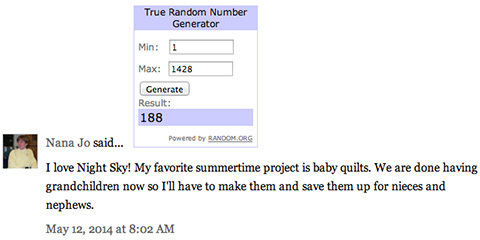 You have till 9PM PST on Monday, May 19th to enter. 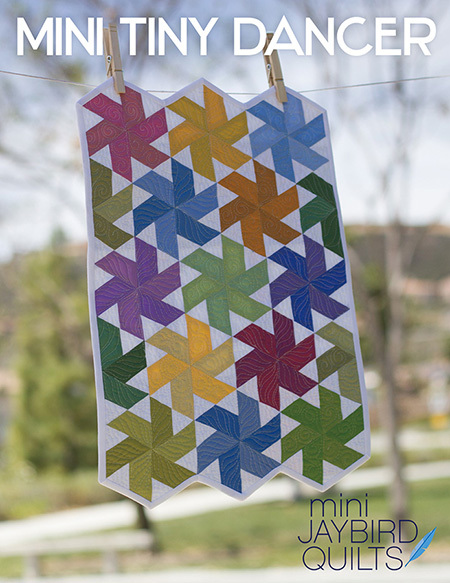 Today we bring you Mini Come What May! 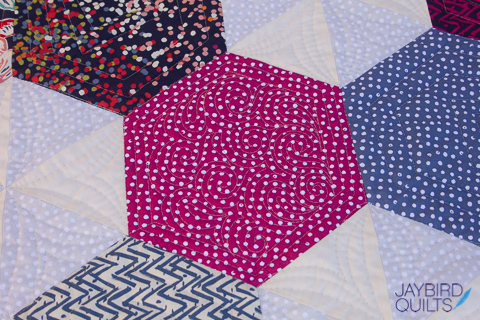 Mini Quilt measures - 16" x 20"
This Mini's big sister pattern, Come What May, is near & dear to me. 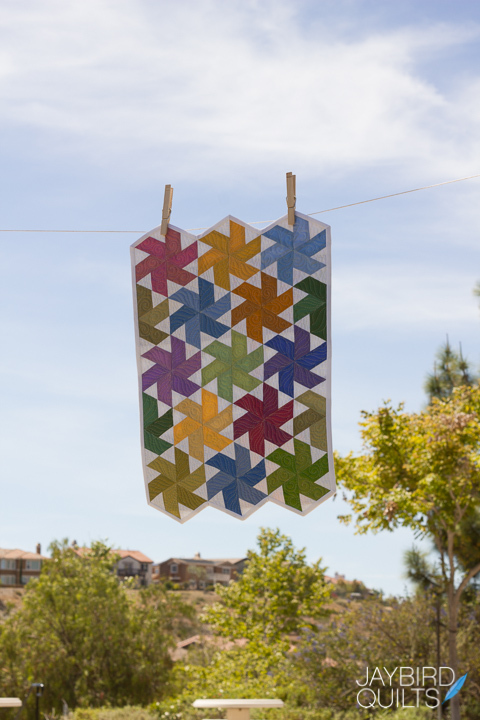 It was one of my first pattern releases after my move to SoCal. 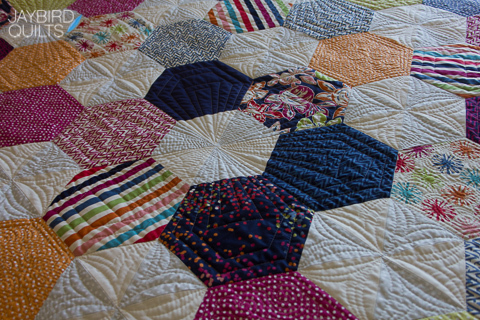 The pattern development and making the quilt was a bi-costal process. And it's just one of my all time favorites. 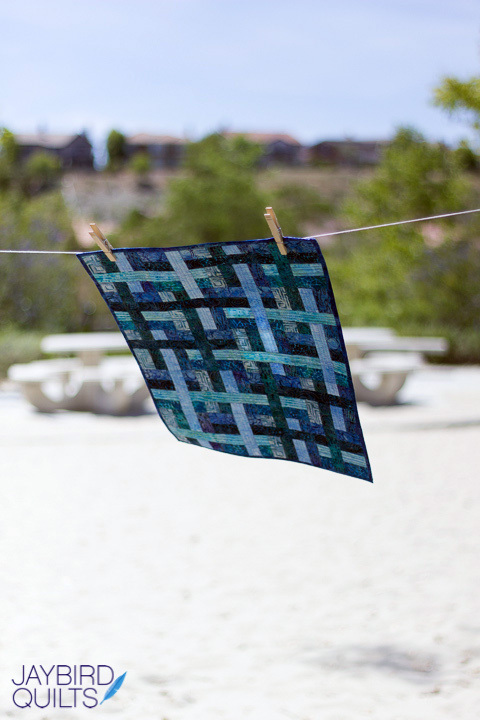 I took her to the playground for the photo shoot on the same day with Mini Lotus, and this one was doing the same dancing in the wind. 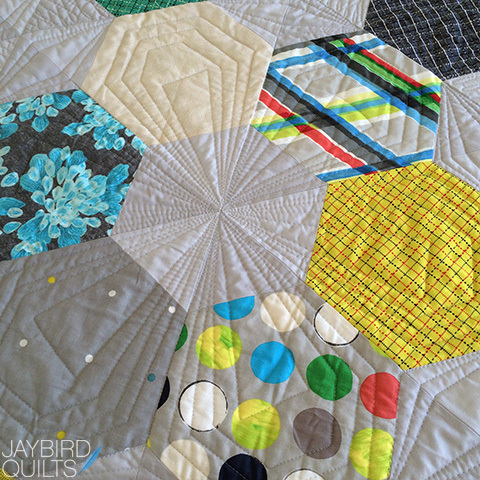 I posted a Single Fold Binding tutorial to help you finish the quilt. 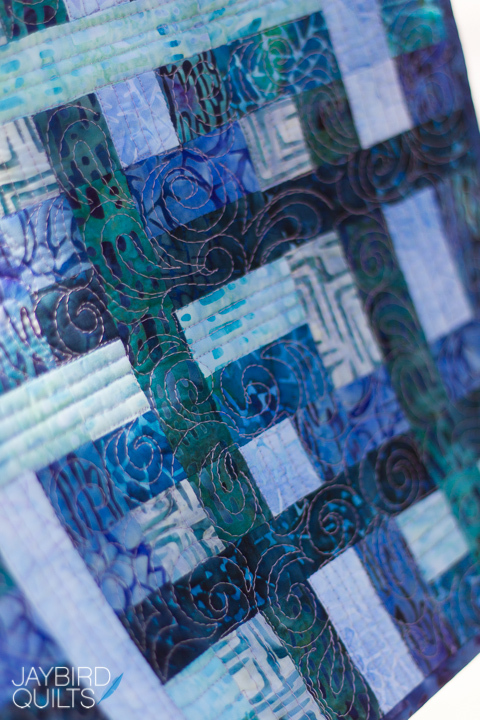 Here's a few close ups of Angela's fab quilting. 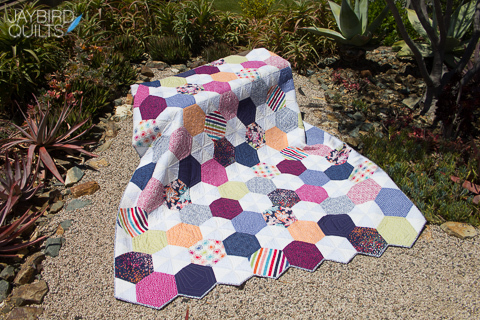 I love Come What May in bright, fun colors, so I made a second Mini Come What May in Dear Stella's Mini Confetti Dots. 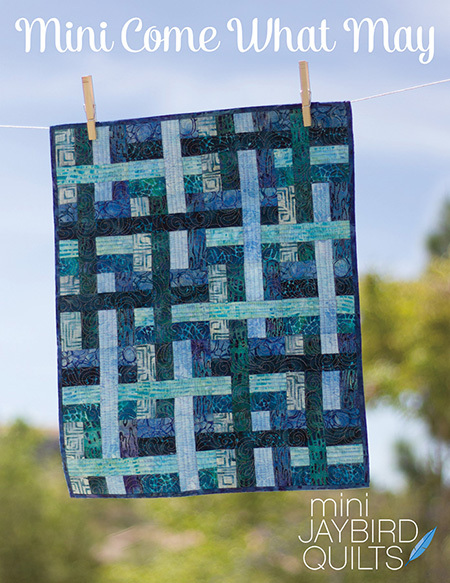 There's no specialty ruler required to make Mini Come What May. 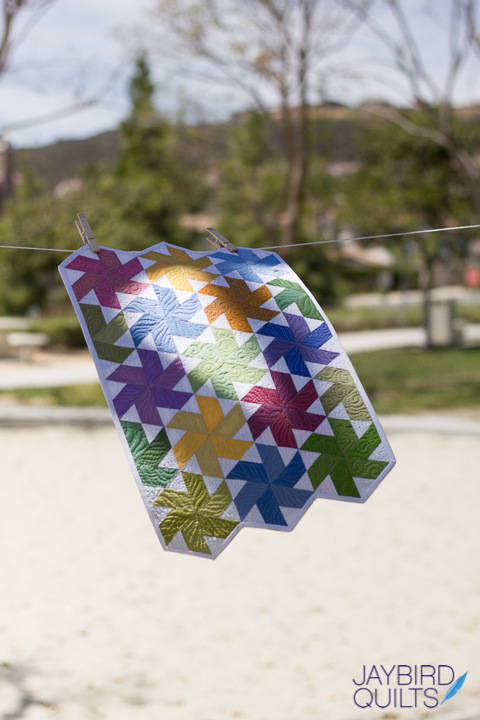 The pattern is printed in full color and is available now at local quilt shops. 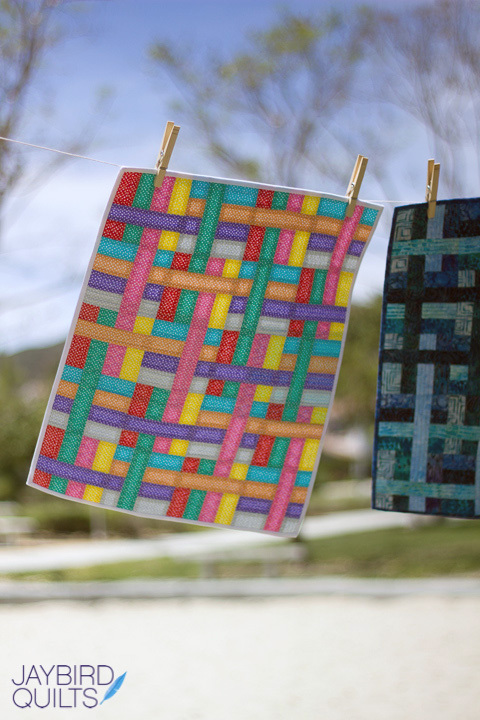 Which mini quilt is your favorite so far? 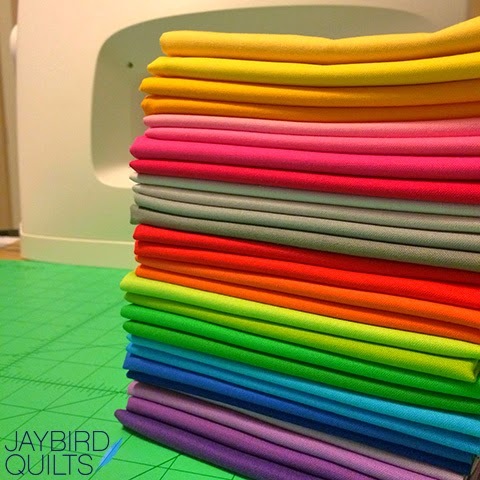 Which ones have you made, or which one are you itching to get a hold of and make ASAP? Tells us in the comments below.